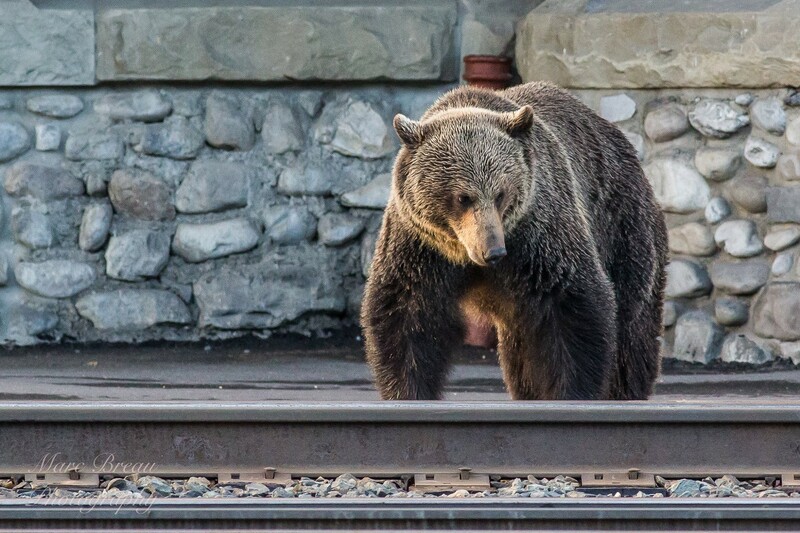 All visitors, residents and businesses in the Banff townsite have a responsibility to be aware of human behaviours that create risks for people, and are dangerous to grizzly and black bears. Coexistence with the abundant wildlife in Banff National Park means we have to help keep bears out of the townsite. Bears that find sources of food in the townsite may not come out alive. Although officials will implement aversion conditioning to discourage bears from returning to town, sometimes the lure of easy food is too great. After getting into human food, a bear will continue to seek out more human food rewards, and this can make them bold and aggressive. Even in an urbanized setting, a bear is extremely dangerous. Aggressive or repeated encounters may result in the bear being relocated or killed. Ensure human food and garbage are not accessible to wildlife. Dispose all food and drink containers, wrappers, household garbage and recycling in the proper wildlife-proof bins. Make sure the bin’s door closes completely. After you have been sitting in an area, check that you are not leaving anything behind when you leave. Call the Town of Banff if you see garbage bins that need emptying. If you see garbage, litter or food waste left outside, please report it to the Town of Banff emergency operations line, 403.762.1240. After hours, press 2 for an on-call emergency number. This is an emergency number. We treat saving human and bears as an emergency. You can also report garbage or other issues to the Town of Banff using the online Action Request. Bears are driven by food. They are intelligent, resourceful and learn fast. They have a keen sense of smell. They will take every opportunity to gain access to food sources and once they discover a food source, they will return again and again. Sows will teach their cubs to access it. Do not leave ANY household material, including unwanted furniture, outside waste bins. We all know food attracts bears. But some people may not know that the human smells on furniture can be equally alluring. The Town of Banff has a special program to pick up any unwanted items and big furniture and appliances for the reuse centre or transfer station. Call 403.762.1240 during the day to arrange a pick up of your large items. if the bear is not aware of your presence, move away quietly without getting its attention. if it is aware of your presence, stay calm. Screaming or sudden movements may trigger aggressive behaviour. speak to the bear in a calm, firm voice. This lets the bear know you are human and not a prey animal. If a bear rears on its hind legs and waves its nose about, it is trying to identify you. back away slowly. Never run as you may trigger a pursuit. get yourself to a safe place - inside a vehicle, your residence or a building. When safe, call Banff National Park dispatch at 403.762.1470. Call Parks Canada for all sightings of bears in town. More bear aware tips are available from Parks Canada.